Millennials Ditching Their Cars: For Now or For Good? It has recently become clear that Millennials – the generation born between the early 1980s and 2000 – are ditching cars and choosing to live in high-density urban neighbourhoods. 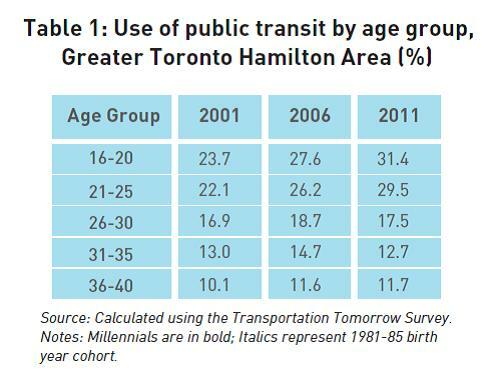 While the link between changes in residential locations and lower car use is evident, it remains to be seen whether aging Millennials will remain in transit-supportive neighbourhoods over time. The centralization of young adults into higher density neighbourhoods began as early as the 1970s when inner cities became less industrial. In addition to the often-cited appeal of cultural and recreational amenities, the central city has been subjected to this “youthification” because of long-term demographic, macro-economic and societal changes. Today’s young adults are staying in school longer and taking more time to focus on their careers before entering marriage and having children. By putting off moving in with a spouse or having children, and in some cases foregoing it altogether, Millennials are increasing the demand for higher density areas where there are more small units available. Given that higher density living in the urban core facilitates lower car use, it makes sense that today’s young adults use cars less since more of them reside centrally. 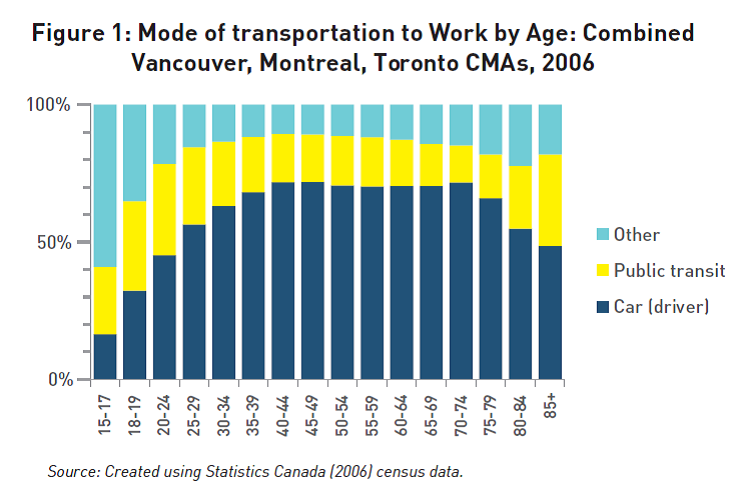 The convenience of walking, cycling and taking transit in these higher density areas makes commuting by car less common for young adults than for older age groups. Despite the obvious positive implications of these trends for achieving planning objectives that aim to reduce car use, there are at least three dimensions that the recent media coverage on Millennials has not kept in perspective. First, it is important to note that a relatively large share of young adults is still using cars for most trips. For instance, 18-24 year olds in the Vancouver metropolitan area used cars for 50 percent of all trips in 2011 based on trip-diary survey data collected by Metro Vancouver. Second, we are currently observing Millennials in an early life-cycle stage that has become extended in part due to the increase in education attainment. Upon entering the workforce, marriage or having children, there has generally been an increase in the total number of daily trips for past generations. This is due to, for instance, young parents finding themselves travelling to school and after-school activities in addition to their daily commute to work. Millennials are entering the workforce later than previous generations, and it is therefore not surprising that Millennials’ car use remains lower compared to when the Baby Boomers were the same age. Thus, we cannot know for sure at this stage whether Millennials will ditch their cars for good. Markus Moos is Assistant Professor in the School of Planning at the University of Waterloo. He is the founder of Generationed City – a research project exploring the ways generational differences shape our cities. Mark Williamson is a student and research assistant in the School of Planning at the University of Waterloo. Ajay Agarwal is Assistant Professor in the School of Urban and Regional Planning at Queen’s University.